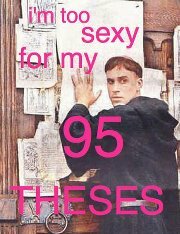 A few moments ago, I wished a friend a Happy Reformation Day. He said he wasn’t sure whether he should celebrate it or not. I said that everybody can celebrate Luther. He agreed, saying that he’d been thinking about such persons as Calvin and Knox. And while Calvin and Knox are certainly part of the Reformation tradition, Reformation Day commemorates a very specific event, which hindsight counts as the start of the Protestant Reformation: Nailing the 95 Theses to the Wittenberg Church door. Do people really celebrate an event which caused many to reject Apostolic Traditions and led to the splitting of the Church into over 36,000 separate groups? Today we celebrated Reformation Day at lunch. A Lutheran friend of mine organised the event. We drank German beer. We played ‘pin the theses on the door’. We threw gummy worms into a bag, the winner gaining a bottle of Diet Pepsi (ie. Diet of Worms). We ate a Luther Bible cake. We sang ‘A Mighty Fortress Is Our God,’ and we attempted to write out ’95 Things About the Church We’d Like to Change’, including such insights as ‘More beer’ and ‘Better songs’. When I wanted to add something about sermons that help explain the songs and the liturgy, the Presbyterian with the pen wouldn’t allow it, saying, ‘We are Reformed.’ This is, of course, unfair that a list of things to change about church that includes ‘More Cats’ and ‘Bacon rolls upon arrival with donuts for Jews, Muslims, vegetarians, and Hindus’ couldn’t have my suggestion, especially because I think Luther would have liked it. Some days I dislike the Reformed. They try to steal the Reformation from the rest of us. Once again, Reformation Day is about Luther, as well, I suppose, as the series of events his challenge to the Bishop of Rome’s authority set in motion. I favour the Magisterial Reformation, so long as we leave room for the Spirit (I am an Anglican who worships with Presbyterians and digs Lutheranism, after all), but the spiral of events led to Mennonites and Hutterites and Baptists and others as well. Luther’s action finally galvanised the Roman church to stand up and reform herself, a good thing, despite all of the other schisms that have resulted in the West from what transpired. Luther, even when I disagree with his answers, was asking the right questions. And he held many of my prejudices — keep the liturgy, keep the images, even keep monstrances for the weak, but put preaching back into the centre of worship, bring vernacular Bibles to the people, help people realise that none of their own works will bring them to the safe side on Judgement Day and so forth. Transforming people from living lives of fear in the face of an angry God for whom no good work is sufficient to living lives of joyful obedience in faith that the God of justice will have mercy in the end — this is a good thing. So drink a beer today in honour of Dr. Luther. He did well. -Martin Luther, from “Preface to the Epistle of St. Paul to the Romans,” in Faith and Freedom: An Invitation to the Writings of Martin Luther, John F. Thornton and Susan B. Varenne, eds.